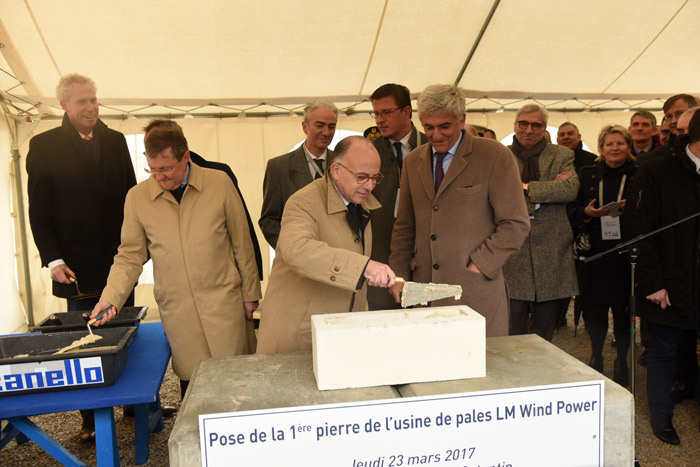 French Prime Minister, Bernard Cazeneuve, helped lay the first stone at LM Wind Power's new blade factory in Cherbourg, Normandy, France. The new facility will manufacture offshore wind turbine blades for multiple customers as LM Wind Power responds to demand for new offshore capacity in northern Europe. 23 March 2017 - LM Wind Power, one of the world's leading manufacturers of wind turbine blades, announced today that work on its new factory in Cherbourg, Normandy, has commenced. This was marked with a foundation stone ceremony at the construction site, chaired by French Prime Minister, Bernard Cazeneuve, in the presence of industry and representatives from the local partners, including Normandy region, the Manche Department, the local community of Cherbourg and the port authority, Ports Normands Associés (PNA). The company brings an initial investment of more than EUR 100 million into the development of the Cherbourg site which is expected to grow to a capacity between 1.2 and 2.0 Gigawatts (GW). The ramp up to production of blades destined for European offshore wind farms is expected during 2018. The company aims to begin hiring and training after the summer, with a plan to reach more than 550 people at the facility once the first production lines are in place. The training will start in a new Center of Excellence, to provide the skills needed for a new strategically important green business. The plant is scaled for future growth and is already in the initial phase expected to generate 2,000 further indirect jobs in the local area. "LM Wind Power is open for offshore business in Cherbourg!" said Alexis Crama, LM Wind Power's Vice President Offshore. "We are delighted to celebrate the laying of the first stone together with our partners for one of the largest inward investments in Normandy by an industrial business for many years. With this facility, we are hoping to attract both existing and new customers that will develop the offshore wind industry with us. Together, we will develop and produce reliable and high performance ultra-long blades that will continue to drive down the Levelized Cost of Energy from offshore wind to the benefit of people and the environment." LM Wind Power CEO, Marc de Jong, added: "The offshore market in Europe provides significant opportunities for growth in the coming years and we are proud to be right at the center of that development with this new Cherbourg blade plant. We thank GE Renewable Energy for their support to this second-to-none project and we look forward to welcoming many new customers and hundreds of French colleagues into our global family."